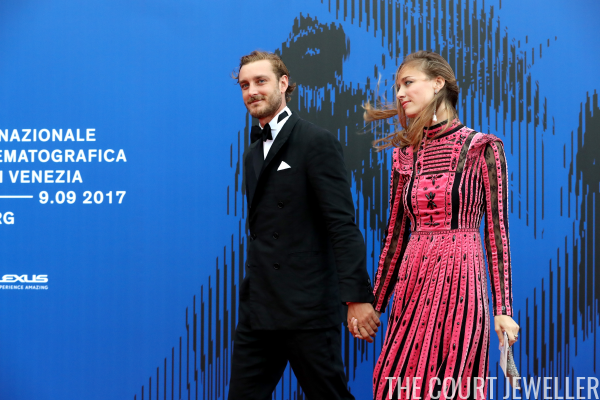 Beatrice Borromeo and her husband, Pierre Casiraghi, the younger son of Princess Caroline of Monaco, walked the windy red carpet at the Venice Film Festival on Friday. Here's a look at the statement jewels Beatrice brought along with her. The star of the accessory show here is the pair of earrings Beatrice wore. These statement earrings feature a pendant set with white and red gemstones and a large baroque pearl drop. Beatrice also added a cocktail ring on her left hand. It's a shame that the red carpet was such a wind tunnel -- Beatrice's hair wasn't exactly cooperating with her jewelry or the weather!